I Didn’t Win the Megamillion, But I Did Win . . .
What an awesome package to find in the mailbox! 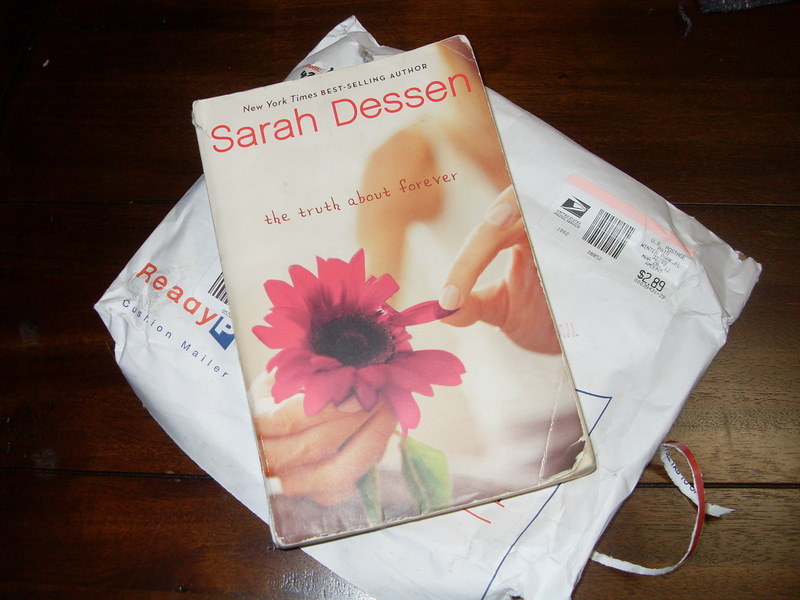 A free copy of The Truth About Forever by Sarah Dessen, all the way from Florida! Lauren is a book-loving librarian (goodness forbid there’s any other kind!) who has started an awesome book-giveaway contest on her blog. She aspires to give used books a good home! Like most libraries, we have a mini store that sells donated books. I’ve decided that periodically, whenever a book I love is dropped off, I’m going to purchase it and give it away on my blog. Because I love you all. And I love supporting libraries. And I love books. And I was the lucky winner of her very first book giveaway! I’m super excited to start reading it–I’ve heard nothing but good things about Sarah Dessen before, but I’ve never actually sat down and read her myself. Thanks again for the book, Lauren; I can’t wait! In other news, a few weeks ago I was nominated for the Versatile Blogger Award, by the lovely Robin Coyle. Thank you Robin! I got this award a few months ago, too, but I don’t think there’s any restrictions on how many times your blog can be appreciated! 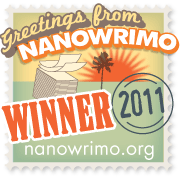 It’s nice to know my blog is still going strong and deemed worthy of winning awards. Thank the person who nominated me. Check. Include a link to his/her blog. Check! Nominate fifteen blogs I enjoy and follow: Way back when I originally won the award, I only nominated 9 out of the 15 other bloggers I was required to, so this gives me the opportunity to finish up! Lastly, tell you seven things about myself. If you really want to know seven things about me, you can read the list I posted last time. For good measure, here’s a fresh thing most of you probably don’t know: Though I’m a bit rusty nowadays, I know all the official AKA dog breeds and can identify pretty much any pure breed dog I encounter in a pet store or see in a movie. This is a holdout from my childhood days of reading and rereading dog breed books from the library. Annie Cardi, a YA blogger and soon-to-be published YA author. Carol Deminski, a writer and super aggressive submitter of stories. If you’re not motivated to submit your stories, you should probably prod yourself into gear by checking out her blog. Mary Stone Dockery, an amazingly impressive poet. Tami Clayton, especially for her hilarious Letters from Benedict series. Her blog always makes me laugh. Lauren Writes, because her blog is awesome and quirky. White Space, especially because of Kristin’s amazing Where Writers Write series–I LOVE snooping and looking at other writers’ desks and creative spaces! Yay! So glad you got it quickly! I hope you like it – it’s definitely one of my favorites by her. So happy it went to a good home! ANd thanks for the blogger award. 🙂 You’re awesome! I love winning ANYTHING–it’s a great pick-me-up for the day. While it might not be the mega millions, a free book is still a great prize! Agreed! It definitely put a smile on my face! I knew there was a good reason I like you . . . I am a dog lover too! Haha, us dog lovers are quite classy people. We’ve got to stick together! Do you have a dog? What kind? William – a dachshund. And a character. He really is my daughter’s dog that she can’t keep because her apartment doesn’t allow pets. We (and by we I mean my mom, because I couldn’t bring the dogs with me to my condo) have a dachshund too–Beans the Hot Dog. Oh man is she a character. Biggest princess you’ll ever meet; she stares at you from the bottom of the stairs until you pick her up and carry her wherever she wants to go. She eats through everything–garbage bags, polyester lunch bags–and licks the kitchen floor from wall to wall at least once a week. Beans and William should meet! He can be her prince. Haha, that would be adorable…if her heart didn’t already belong to my ragmuffin of a Welsh terrier! (See profile picture.) They’ll literally make out for long stretches of time, just licking each others faces. And they like to curl up in the same dog bed together. It’s revolting how much they act like they’re honeymooning, all the time. Congratulations on the book and your story. I was tickled you mentioned the Nail Polish stories last week and I have one in it this month too. Thanks again. It was such fun! I went back and read your nail polish story; it had such great rhythm, congrats on getting published! And thanks for the congrats! Wow! Thanks for the nomination! Greatly appreciated and I will certainly pay it forward. Of course! You’re welcome Benedict!